Railpictures.ca - Stephen C. Host Photo: As discussed in my last photo, after shooting CN 550 I heard SOR call to head down the N&NW Spur so I set up for a shot I’ve had in mind for a while. You don’t exactly know where the SOR is going to go, for example, they could work the Bunge leads instead, but once I heard “RLK 4001 clear on the approach to Irondale” I knew I made the right choice. Irondale is a curiosity as this location has a long railway history. This location had long ago been a CNR/TH&B interchange point for the Radial and was a stop on the Hamilton Radial Electric Railway. The Hamilton Street Railway also continued to interchange cars here for CNR/TH&B for Firestone until the late 1940′s and the name Irondale has stuck to this day as a result. The diamond and signalled crossing is for a CP industrial lead crossing the SOR (CN owned) N&NW spur mainline. For more on Hamilton’s interurbans, see this Andrew Merrilee’s article from approx 1950. After this I went back to see what CP was up to, and they were lifting a loooong cut of cars at NSC – which is usually the last thing they do before heading back to the yard. So I scoped out a shot and found something new to me. Next photo. | Railpictures.ca – Canadian Railway Photography – photographie ferroviaire Canadienne. Caption: As discussed in my last photo, after shooting CN 550 I heard SOR call to head down the N&NW Spur so I set up for a shot I've had in mind for a while. 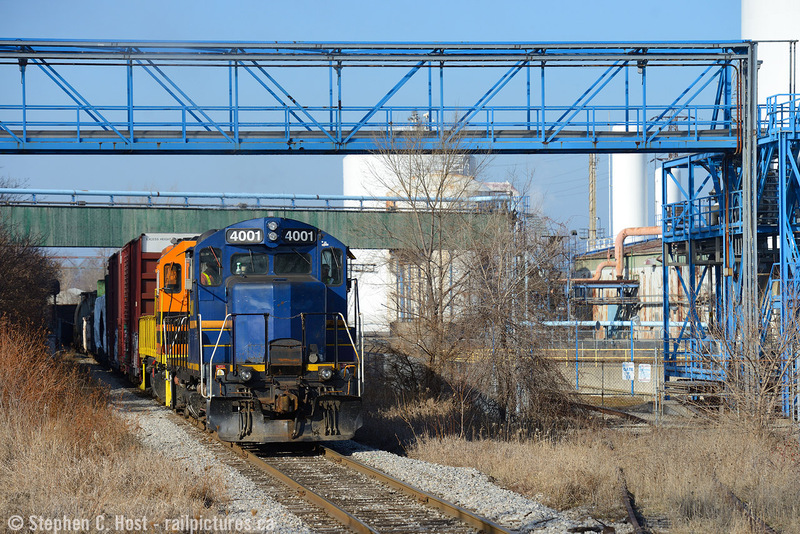 You don't exactly know where the SOR is going to go, for example, they could work the Bunge leads instead, but once I heard "RLK 4001 clear on the approach to Irondale" I knew I made the right choice. Irondale is a curiosity as this location has a long railway history. This location had long ago been a CNR/TH&B interchange point for the Radial and was a stop on the Hamilton Radial Electric Railway. The Hamilton Street Railway also continued to interchange cars here for CNR/TH&B for Firestone until the late 1940's and the name Irondale has stuck to this day as a result. The diamond and signalled crossing is for a CP industrial lead crossing the SOR (CN owned) N&NW spur mainline. For more on Hamilton's interurbans, see this Andrew Merrilee's article from approx 1950. After this I went back to see what CP was up to, and they were lifting a loooong cut of cars at NSC - which is usually the last thing they do before heading back to the yard. So I scoped out a shot and found something new to me. Next photo.